A telescope is a spectacular scientific instrument that is accessible to people of all means and abilities and opens up the wonders of the Universe. Like all things technical it is a tool and you will only be able to use it with the correct training. Also, typically, there are a number of different types for different uses making selection of your first telescope a little confusing. So how do you choose which one to buy first? As usual the first thing to decide on is your budget. You will find that the price range of equipment is phenomenal. From just a few dollars to many thousand dollars. There are bargains to be found so do your research carefully. The next thing to decide is what you want to use the telescope for. There are two basic technologies used to make telescopes: Refraction and Reflection. A refractor telescope uses two lenses to collect and focus light at a certain point. This design is the classic telescope invented in Holland and made famous by Galileo Galilei in 1609, and also used by Admiral Horatio Nelson. This is a handy instrument capable of being used for terrestrial observation as well as celestial. A reflector telescope uses mirrors to gather and reflect light. Typically there will be two mirrors a large primary mirror and a smaller secondary mirror. The primary mirror determines how much light is received and the secondary mirror directs the image to the eyepiece. There are a number of different types of reflector telescope mainly differentiated by the path of light through the instrument. The two most common types are Newtonian and Cassegrain. The Newtonians focus and direct the light to the side of the optical tube, whereas the Cassegrains reflect it back to the bottom of the tube allowing for a more compact design. Before going any further it is worth understanding how telescopes work. Your first thought maybe that you need to magnify distant objects to make them visible. This is wrong. A star that appears as a dot that is 2 light years away will still be a dot magnified 1000 times. The purpose of a telescope is to gather more light than the human eye can see and condense it. This then brings more faint objects into view. So a telescope is effectively a big light bucket. This is an important concept to grasp. In photography you need long focal lengths to capture distant images at the expense of the amount of light received in the camera. The trick here is to gather as much light as possible then focus an eyepiece on it. The magnification is done using the eyepiece in a similar way that a magnifying glass works. The next thing to consider is what you want the telescope for? It may seem like a silly question, but looking at craters on the moon is vastly different to photographing faint nebula clouds thousands of light years away. The Moon and the planets are the brightest objects in the sky and need less light gathering capacity than other stellar subjects. If the primary purpose of the telescope is planetary observation then a Cassegrain or Refractor style of telescope is ideal. These offer longer focal lengths allowing for greater magnification. When looking at star clusters, distant galaxies and nebulas you need to get as much light as possible. This is where size matters, and the larger the primary optic the better. Reflectors offer very good light gathering/price performance, but at the expense of physical size. It does not matter how good your telescope is, if it is not anchored on a solid foundation then it will not be working at its best. Indeed many advanced astronomers pay far more for the telescope mount than they do for the optical tube. There are two types of telescope mount available: an altazimuth mount, and a German Equatorial Mount. The altazimuth or Alt-Az mount is similar to a tripod used for photography. Indeed I use a photographers tripod myself when travelling. This is a little crude in that the control of the position of the telescope although more expensive tripod heads can give some fine degree of movement. More expensive mounts have slow motion cables allowing fine tuning of the telescope. The Alt-Az mount has two controls and works on the principle of compass direction (azimuth) and elevation (altitude), effectively moving the tripod up and down or left and right. To keep an object in view over a period of time both controls need to be adjusted. 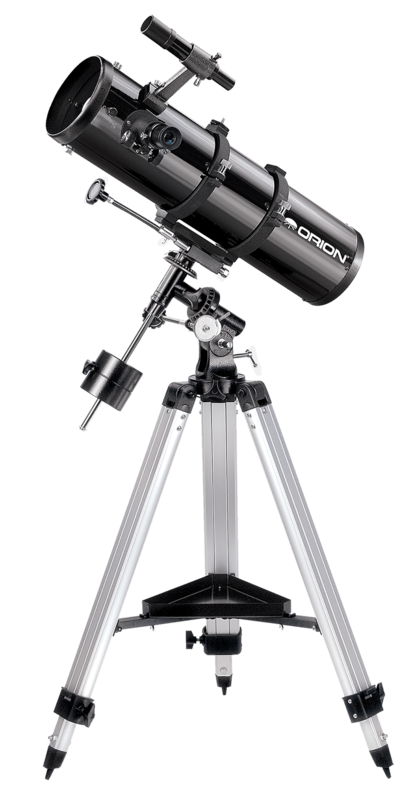 The German Equatorial Mount, also known as an equatorial mount or GEM, is a much more complex mounting system that takes into consideration the movement of stars around the celestial pole (see info panel). Setting up the equatorial mount can be complicated as one axis of the mount needs to point to the polar star. Once properly aligned the stars can be tracked just by using a single control. This control can be driven with a motor enabling the precise tracking of stars throughout the night. This type of mount is ideal for astro photographers as it keeps the aspect and relationship of the stellar objects aligned over time. Another type of mount available is a Dobsonian. This is actually a variant of the Alt-Az mount but with the base actually on the ground with a swivel plate. The telescope drops onto this and there are friction plates to control the elevation. This type of telescope looks like a canon. One advantage of a ‘Dob’ is that it can be very large, but still controllable by hand. So far everything has been ‘low tech’ in as much as it is pure physics and engineering. To use the telescope you need to understand the movement of the stars and be able to find and hone in on the objects that you want to view. Wouldn’t it be nice if you could press a few buttons and the telescope would move to your area of interest and keep it in view as the earth rotates? The advent of the GOTO mount has achieved this. To the purists this is sacrilege, but for observers with limited time and experience it is a boon. The technology does make us lazy and prevents us learning the full majesty of the night skies, but on the other hand it opens up a new frontier to those who do not have the time or the inclination to learn the constellations. The GOTO mount needs to be calibrated each time it is used. This lets the electronic wizardry know exactly where it is and what the time is. From that it knows where all the stars are and which ones can be seen. Once set up all you need to do is press a few buttons and the mount will orientate the telescope to your target object and then start tracking it through the night skies. When we look at astro images in the media and online we often see wonderful multicoloured pictures in clear sharp detail of stars drifting in clouds of nebulosity. I had expectations of seeing something like this when I looked through my first telescope. I was wrong! These images are created by sensors capturing photons for many hours and then being processed and enhanced in computers. When you look through the eyepiece your eye must collect and process all the available light instantly. The fainter the light the less you will be able to see. This is one of the reasons astronomers use ‘dark sites’ and accustom their eyes to the dark. It takes around 20 minutes for your eyes to get used to the dark and your pupils fully dilate. This allows more light to reach the retinas letting you see the finer details. It doesn’t end there though, your eyes are adaptive and in low light will switch to monochrome, letting you see more but at the expense of color. This is the reason that size matters in the telescope primary lens or mirror, more light getting to the eye means more detail. This does not mean that you will not be able to see some great objects. Of course the moon is always stunning, its brightness means that even the cheapest and smallest telescope will render detail. The brightest deep space can be seen with the naked eye, in particular Orion and the Pleiades. Training the telescope on these will reveal a lot of detail. The clouds of nebulosity in Orion and the stellar dust around the stars in the Pleiades can be spectacular. A telescope is a light bucket. The bigger the bucket the more you can see. If you are looking for portability then a Cassegrain style of telescope is good, for performance then a reflector would be my choice. Getting bang for bucks the Dobsonian is hard to beat, and for an all round performer then a refractor is one to look at. To make things easy then a GOTO mount helps enormously. The telescope is the first part of the astronomical experience. Most telescopes will come bundled with one or more eyepieces, but it is the eyepieces that can make all the difference to your observing experience. I will be covering eyepieces in a separate article. When I started in astronomy my personal kit was a 90mm (3.5”) Spotting Scope with a Maksutov-Cassegrain design. It mounts on my photography tripod and is light and portable. This was very quickly joined by a 5” Newtonian reflector on a GOTO mount, it is less portable but better for deep sky observing. Both of these were obtained for just over $500, though I have spent somewhat more on accessories since.